The growing Game Boy Advance library on the Wii U Virtual Console has already brought us some excellent titles, but the latest announcement will no doubt have strategy fans rather excited. Fire Emblem — the Game Boy Advance version that was the first in the series released outside Japan — will arrive in this week's European update on 21st August. Even better news is that, at launch, it'll cost just £4.40 / €4.89 in its first week, after which time it'll revert to the standard £6.29 / €6.99. This is due to this release being part of the second week of Super Smash Bros.-themed discounts in the region, which we'll cover in detail separately; there are no details as yet on a North American release. Yes! This is the most excited I've been for a VC release since Earthbound. I only got into Fire Emblem with the release of awakening and the GBA games are extremely expensive now. I bought the GBA cart recently but I'm still getting for Wii U VC (the GBA cart unlocks exclusive content for Path of Radiance). Woo! All aboard the hype train! 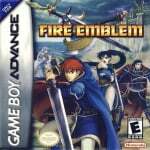 As the GBA games are so expensive I will probably download Fire Emblem while it is on sale. WHY NOT HERE? I WANT THIS SOOOO BADLY! If this came out in NA, I might actually buy a Wii U. Sweet! I loved Sacred Stones so i'll pick this up! The discount only makes it bether. Not my favorite Fire Emblem aside from Lyn's story, but man would I love another three save files on the big screen. Come on, NOA! C'mon America. This would be awesome. I was so close to beating the game last year, but some guy at school decided it would be funny to pull the cartridge out of the system while I was playing and it deleted my save data. Since I don't play my Gameboy Advance that much any more I haven't gone back to it yet but this is the perfect excuse to go through it again. @ikki5 yeah. Reggie needs to pick up the discounts, and games over here. It really is annoying. Yeah, North America needs to release the games that Europe gets and forget the discounts and games that they don't get! I bought my copy of Radiant Dawn used a few years ago and it's actually scratched, but I couldn't trade it back because I put it on my backlog at first and then the random crashing that occurs didn't happen until I was well into the campaign. However, even with disc read errors that occasionally crashed the game, I still fought and played through and beat the game...it's that good! I'm assuming NA will get it eventually. But I'm still mad. Thanks, I will get it! Which reminds me of the Metroid Prime Trilogy I bought, used, from GameStop a few months back. I still don't have a lot of time to put on it. It also have some scratches/spots. I bought it in a heartbeat only to find out later that there are a lot of better (like new) copies from other GameStop stores within the city. I hope I won't encounter some errors when I get to put a lot of time playing it. @Action51 Yeah, there are certain things that can crash Radiant Dawn (and Brawl) on a Wii U. For me it'd crash when Volug battled and at the "End of Part X" graphic if I didn't skip it. And Brawl crashes whenever my Wii U attempts to fathom the power of Captain Falcon. WHERE THE HECK ARE YOU, NINTENDO OF AMERICA?! Will pick this up when it makes it to NA in the next few weeks. Never played this one so I'm excited for something "New"
Will definitely buy, since as this is the original? and plus it's at a discount price! This is one of my favorite games ever! I'll wait for NA launch! @S3OL It's not the original, it's the 7th game in the series. Will buy it because im a fire emblem person. Dont even expect to have time to play it. North America can we please??? @King47 yeah, we;l get it sometime within 1-5 months. Why is NA getting forgotten about so much lately?? Is this the same as the 3DS ambassador program fire emblem? Nope, the ambassador one was Fire Emblem: Sacred Stones (FE8), this one is Fire Emblem (FE7). As a series fan, I of course already have the cart, so no need for me to buy a ROM. This is great for new players whose morals are too high for them to consider unpaid emulation. @FishieFish oooh, now I'm interested...but I may still pick up awakening. Damn you Nintendo. I have the GBA cart but at that price I will also buy it for Wii U. Do make sure to pick up the virtual console one some time. Awakening works better as a portal for beginners, but it's also mostly just a fanservice game (not as in perverted fan service). Blazing Sword (the one now on the Virtual Console) is much better as a Fire Emblem game than Awakening. For one thing it has much more charm to it. Nintendo Rep: Crap, we only have 1 FE game we can discount! Nintendo Rep 2: Well then just put one of the GBA roms up then! Brilliant. What was a rather dull download update on Monday has become a great one, with just one game! Cannot wait! Awesome was waiting for this ever since the JP release. @AVahne Sweet, thaks buddy! Never played a Fire Emblem game, but loved the Awekening Demo. I will pick upit first and move on to Blazing Sword after. Amazing price!!! The GBA titles are the only Fire Emblem games I've not played. Never been so excited to play a VC game before. Still got the GBA version and my trusty Micro so no reason to get this. @ikki5 Why wouldn't this release in North America?! Or are you referring about the discount? Maybe Roy now has a chance at returning to Smash? OH MY GOD YES! Finally! And even a discount! I was so scared these would only be Japan-exclusive..
@BlackSpy - Looks like his too busy with ice buckets to worry about that. In all seriousness, I always thought he was all for VC in the US due to the great sales. Super, this will be my entry point then! I am tempted here, as I would like to play the game again and it is a great title, but as with all the GBA VC titles, it's on the wrong damn console! VC tied to account not console. "Virtual" link cable for multiplayer. Buy once. Play on 3DS on plane/train/bus, continue on WiiU at home. That's worth £6.29 (well over $10 BTW!) to me. Without those features, I struggle to justify even the £4.40 intro price to myself regardless of how good the game is. I don't care how much an original cart is on eBay - a cart is a physical item, and can be resold if you don't like the game or finish it. A digital download has no intrinsic value, and needs to offer some real benefits other than just making my home console into a GC GBA Player (which was a fairly unpopular add-on as I remember). @Grumblevolcano I'm talking about the GBA version. articles like this piss me off! games like this should be on the 3DS VIRTUAL CONSOLE!!! not on the WII U VIRTUAL CONSOLE!!! For a second I thought this was Sacred Stones which I already have on GBA. So this is the one with Roy from Melee? Should check it out. Especially for that price. Roy's game is indeed on GBA, but it's Japan-only. This is the prequel, starring Lyn, and later on Eliwood. Eliwood is Roy's father in the Japan-only game. But, in this one being released on Wii U, Roy hasn't been born yet. Get your wallet ready then because I'm sure this game is on the way! I'm glad they're releasing this one instead of Sacred Stones, considering I have that on 3DS already. But, hopefully they'll release that one too later on. What would really make me happy though, is DKC trilogy. Good news! I am almost at the end of Fire emblem awakening, and I really like it. So yeah, downloading this one (though perma-death may be a issue, though I guess I can reset when that happens). That's good, Lyn is one of my favorite FE character, I stil wish she would be playable in the next Smash. This game needs to come to the US. Ooh, yes. I normally avoid VC downloads since downloading 18 of them and then irrevocably losing them when I sold my first Wii, but I'll make an exception when a game is this good and so expensive on eBay. That is, I will if it comes to North America. I say we bug sakurai to make He tor a character in smash! He would be awesome! Awesome! I'm in the middle of FE:Awakening and I'm loving it! Good to know I'm playing as Unborn-Roy-From-Melee's Father when getting into the game soon, but really, a freakin Rakugakid? WHAT THE HECK NINTENDO! BRING IT TO NA!! Awesome. Here's hoping we'll see more of this series. I've only played the Wii one through all the way (I picked up the GameCube version later, but found some of the options too limiting compared to Wii). Shame I sold it - HD remake candidate?